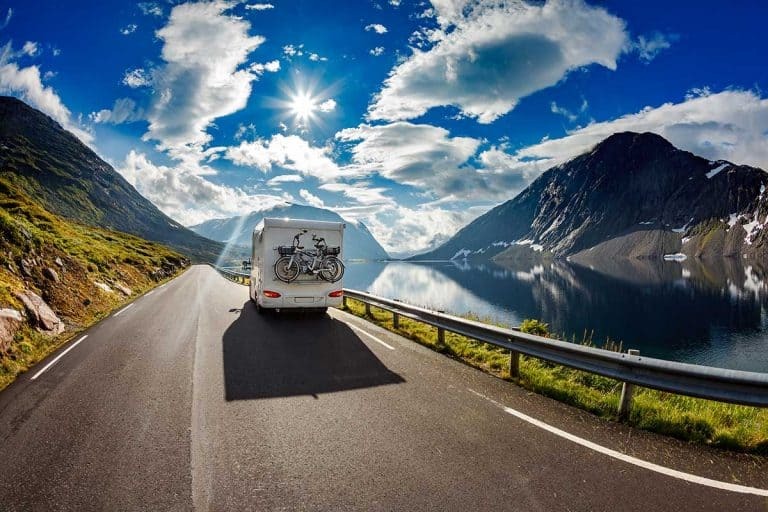 After you’ve purchased the 5th wheel that’s perfect for your travel dreams, you’re ready to hit the road. But what if you’ve never pulled a 5th wheel before? Our family went through this exact dilemma when we bought our first 5th wheel and had to learn how to tow it. 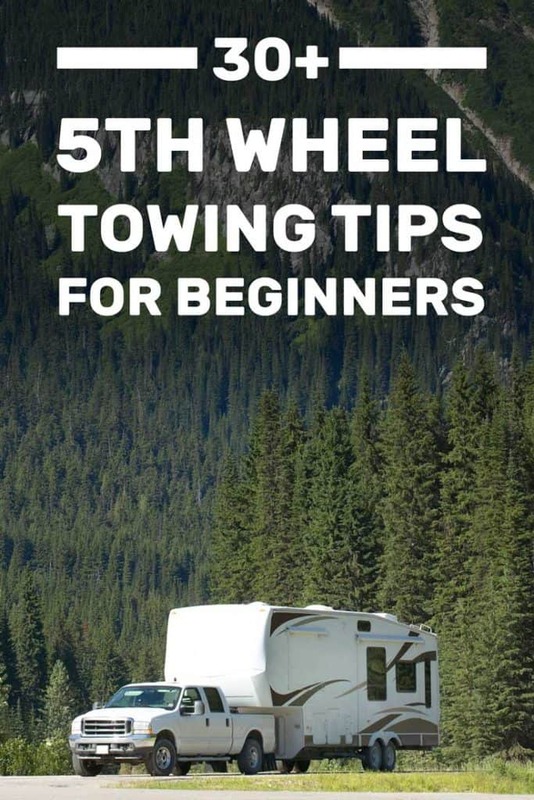 There’s a lot to learn at the beginning, but if you remember these tips, you’ll soon be confident towing a 5th wheel. It may sound intimidating, but we are not mechanical experts and we’ve now towed our 5th wheel across 35 states. If we can learn to do it, so can you. I’ll walk you step by step through towing your 5th wheel on your first trip. Surprisingly, many of the important tips for pulling a 5th wheel happen before you even start driving. Safety while on the road starts beforehand, with careful planning, maintenance, and precautionary steps. Know which roads you’ll be taking to get to your destination. 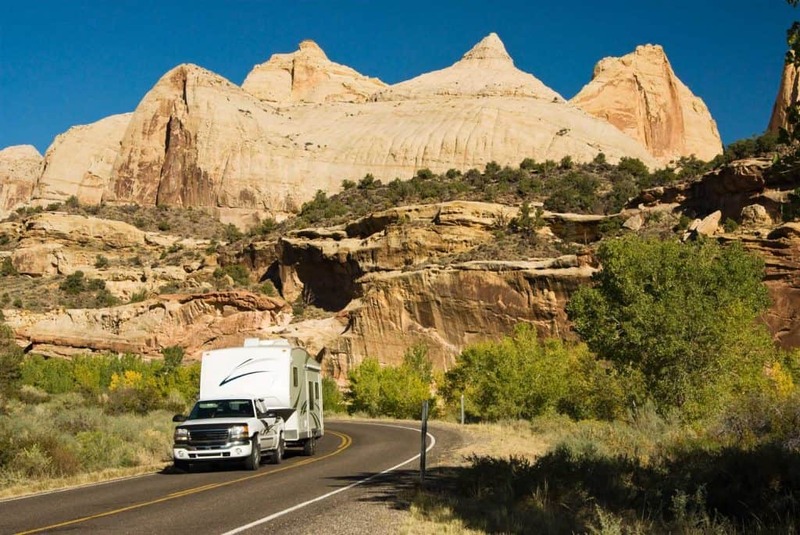 Try to stick with major interstates that are recommended for trucks and RVs. If you’ll be taking smaller expressways or county roads, check ahead of time to make sure they can accommodate the height and length of your rig. It’s also smart to plan ahead of time for stops you may make en route. 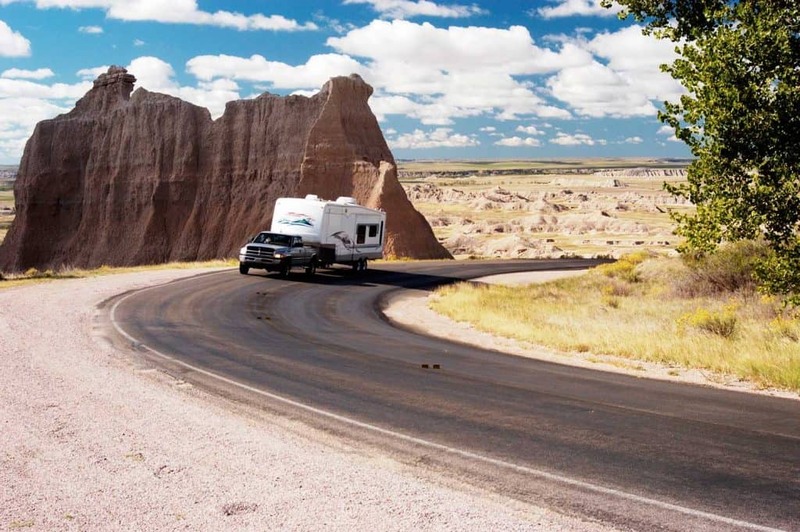 If you want to see a famous roadside attraction, make sure there are RV parking and space to turn around. Bathroom breaks also require some forethought. We recommend truck stops and highway-designated rest areas as safe places to pull in for a quick break. 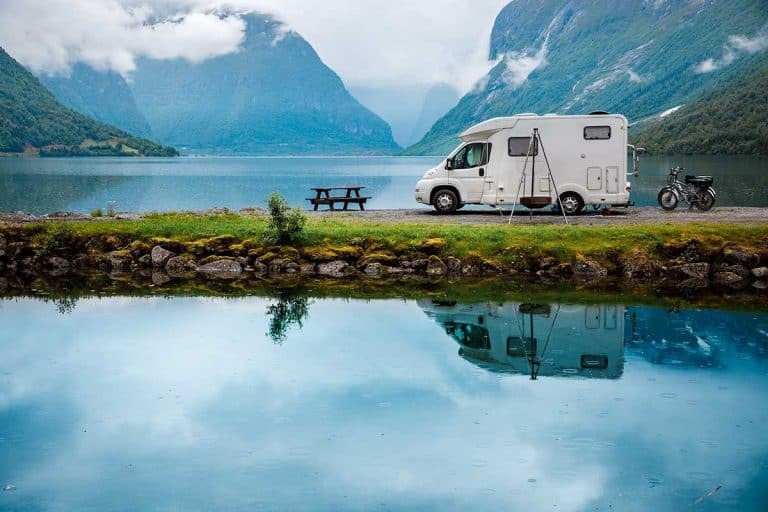 When first starting off in RV travel, it’s a good rule of thumb to add an extra hour onto the GPS suggested time of arrival to any destination. At least. Give yourself plenty of time to get to where you need to go, and don’t rush. 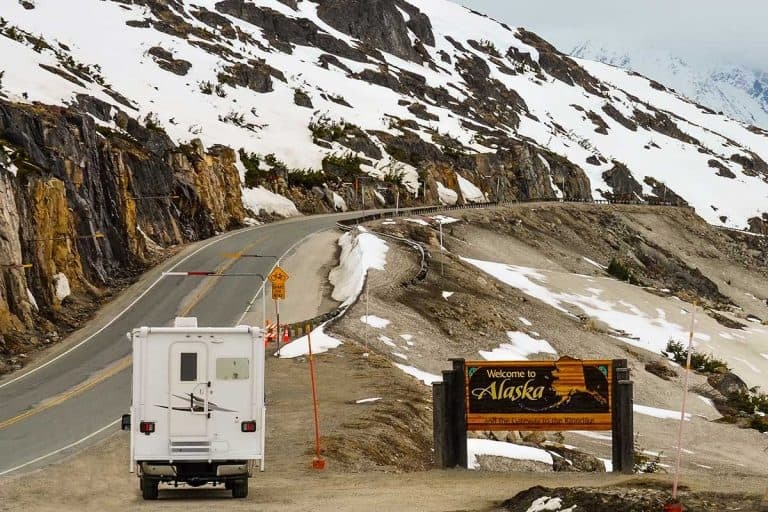 Adopt the mentality that RVing is a slower way to travel, and enjoy it. After a good night’s rest, wake up early and get ready to hit the road with your 5th wheel. Here are some things to do immediately before you hitch up. Carefully inspect the tires of the 5th wheel. Check the tire pressure and look to make sure the treads are intact. Make sure there’s no uneven wear. Lug nuts should be tight. Glance underneath the rig, looking carefully at the axels and suspension brackets. Make sure there’s nothing loose or hanging down. If it’s you’re first time taking out your 5th wheel, the gray and black water tanks will already be empty. However, after camping in your 5th wheel for a few days, you’ll want to empty those tanks before hitching up again. 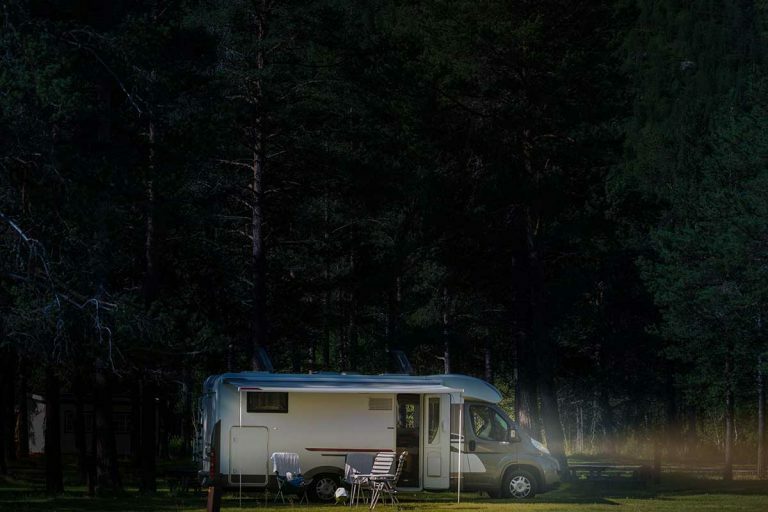 Before unplugging your 5th wheel from any power source, be sure to bring in awnings and slides. If you’re driving your 5th wheel off the lot, this won’t be an issue. But if you’ve been connected to a power source before hitching up to go on a trip, be sure to disconnect and store the cord. Make sure all the cabinets are tightly shut, and no items are left out on counters. Small furniture with wheels need to be secured so they don’t move during transit. Wall hangings should be mounted securely or taken down before driving. We assume that you already have the appropriate hitch installed in the bed of your truck. If you have any questions about installing your 5th wheel hitch, check out this article here. Now, let’s continue with the hitching up process. A very obvious step, but one worth mentioning. This could have disastrous results if this step is overlooked in the eagerness to hitch up. Make sure the hitch is open and level so that the kingpin can slide into it. Climb up into the truck bed if needed to adjust the hitch plate. If you have auto-leveling, use the electronic panel to bring the 5th wheel to the level of the hitch. Eyeball the pin box on the 5th wheel so that it can slide into the hitch on the truck. If you have manual jacks, crank the 5th wheel up or down so that the kingpin is level with the hitch. Slowly reverse the truck until the hitch jaws securely lock onto the kingpin. In our family, one person backs up the truck and another person is on the ground giving hand signals to guide the driver. The ground person is also able to adjust the height of the rig if the kingpin is not lining up. Once the kingpin is securely fastened into the hitch, lock the hitch. There will be a latch that locks the pin into the hitch. Attach the breakaway cable to the lever of the hitch. Make sure that the cable doesn’t interfere with the turning radius of the pinbox. Connect the electrical cord to the trailer. This powers the tail lights and brakes of the 5th wheel while driving. Again, a self-explanatory tip, but important to remember! Using a buddy system, have one person watch and make sure that brake lights and turn signals on the back of the 5th wheel work properly. Bring the landing jacks up, using the manual or electronic system. Manually remove the leveling blocks and store in an accessible place. Wheel chocks can be removed at this time as well. Make sure entry steps are folded up and any handrails pushed in. Now that the driver is behind the wheel, be sure to adjust your side mirrors. You should have towing side mirrors on your truck that allow you to see down the entire length of your 5th wheel and behind to other vehicles. Trucks with a tow package will have a trailer brake system already installed. If you’re using a truck that does not have trailer brake control installed, you need to purchase a separate brake control box to install near the driver’s seat. We recommend starting off with the brake pressure in the middle range. However, there are many factors that will affect how quickly your rig brakes and each vehicle is different. Go slowly and test this out as you drive. If you feel like it’s taking too long for the brakes to respond, you’ll want to increase the pressure. If it feels like the rig is jerking or braking too quickly, decrease the pressure. Adjust the pressure one increment at a time and you’ll get a feel for the brake pressure that’s best for your rig. 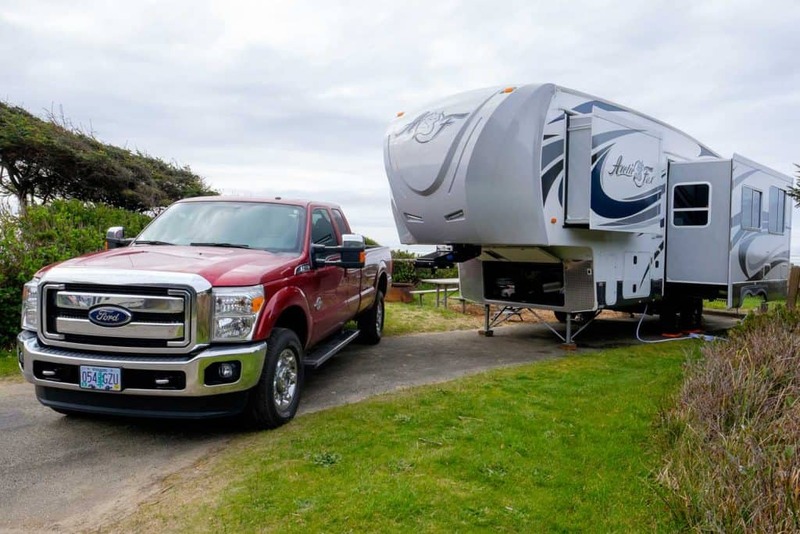 Traveling with a fifth wheel is not for those who need to get places quickly. Embrace the journey as you gaze out the window and allow vehicles to pass you. 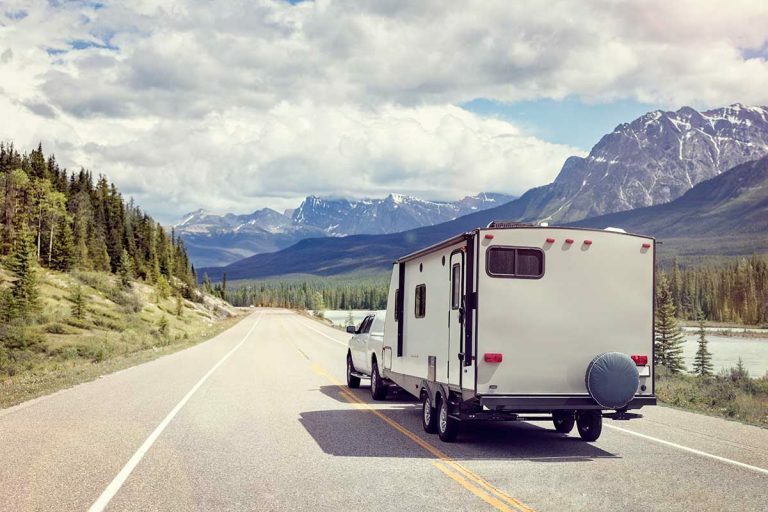 This article gives specific guidelines for speeds while towing an RV. Give yourself plenty of room to make wide turns when pulling a 5th wheel. Go further into an intersection before initiating your turn and check your mirrors to see where the trailer tires are as you turn. This is probably the skill that takes the most practice when you’re learning to tow a 5th wheel. Many RV owners keep their length, height and weight written down in a place the driver can easily see. Length and height won’t vary, but weight can change. Know your combined truck plus 5er length, and maximum height for narrow roads or low bridges. Weight is a very important factor when towing any type of trailer or 5th wheel. Owners should know what the dry weight of their rig is, and what they weigh when they’re fully loaded. Find a CAT scale and weigh your rig when loaded. Pulling an overweight load can cause many problems to occur, so follow your tow capacity guidelines carefully. While you’re in transit from one place to another, you’ll likely need to make a bathroom or food break. 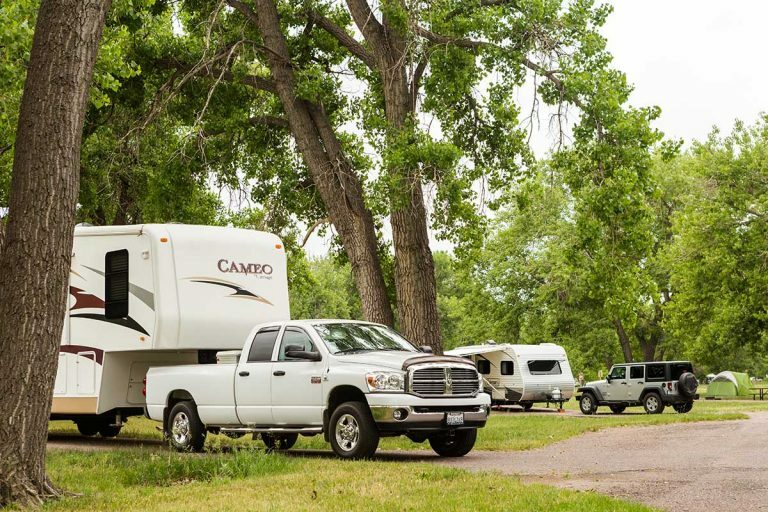 Here are a few tips for making a smooth rest stop with your 5th wheel. Ideally, you want to find a rest area that has a large parking lot with few vehicles. Just because a parking area can accommodate large truck and vehicles, doesn’t mean that it will be empty. You’re looking for pull-over or pull-through parking. Preview the area before entering, and scout out the place you can park safely. Check to see where your exit will be as well. We have driven around whole blocks, trying to figure out where we should park. It can be stressful, especially if riders are very eager to get out of the truck. Just remember that you’re not in a hurry. Being safe is more important than arriving early. Backing up the rig is the most difficult skill to master with your 5th wheel. When first starting out, plan to have a partner help you with backing up. Someone on the ground can tell you exactly where your rig is going and what adjustments you need to make to back in safely. With said partner, work out how you’ll communicate during the back-up process. We use our cell phones in speaker mode (and hands-free in the truck) to communicate with each other while backing in. Occasionally we’ll be backing into a site where there is no cell reception, so walkie-talkies or a two-way radio system is a good back-up. Many a spousal argument has occurred while trying to communicate how to back up the trailer. Be specific and use terms that are clear to both partners. When the partner on the ground says turn right, does that mean turn the steering wheel right, or turn the 5th wheel right? It’s hard to explain, but trust me, turning the steering wheel one way does not translate to the 5th wheel going that same way. Try to stay calm and remember that you’re not in a hurry. Over time, you’ll figure out how to communicate clearly about backing up. In the meantime, you’ll be providing valuable entertainment to onlooking campers. 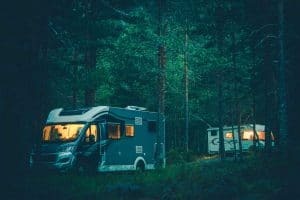 When backing into a campsite, pay attention to where your power, sewer and water connections are located. Look at where your slides will be after they’re extended. Make sure you position yourself in a place where you can access all of your utilities. If possible, try to park in the most level part of the parking space. It will be easier to unhitch and level your 5th wheel if the ground surface is also level. When unhitching, you will basically be reversing the order of the hitching up process. Setting up the leveling blocks, chocking the wheels and dropping the jacks happens before unhitching the 5th wheel from the truck. 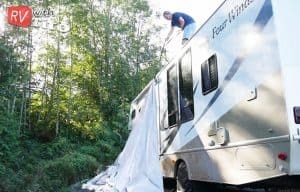 Once the 5th wheel has been unhitched, you can make all your leveling adjustments, extend your slides, and connect all the hoses and cords. All that’s left to do now, is to enjoy your 5th wheel and celebrate your first successful tow experience!